If anyone could assist with an issue, I'd be very grateful. I'm having trouble figuring out the proper location of the outer edge of a shape using a line query. 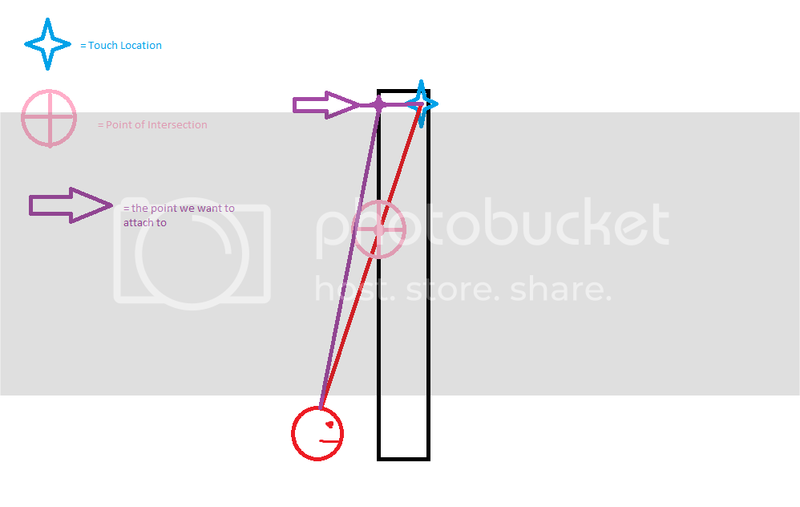 I'm querying the space from the location of let's say, the player's shape, to a touch point (which is another shape), and was using the first point touched as the location to attach a sliding joint that connects to the player. The problem I am facing is the intersecting point is not always the proper point in relation to the touch location, and I'm having trouble figuring out how to account for that. Hopefully this picture helps. Unfortunately it's nearly that simple if multiple shapes are involved. Your purple location might be inside of another shape that the raycast didn't even hit. What you really want is to find the closes point on the polygon to the touch point, but you'll have to calculate that yourself as Chipmunk doesn't have any functions to do that. I'm not sure how you can merge that with the raycasting into anything meaningful though. Ah, yes, excellent. Thank you for the suggestion there. I had considered doing something like that, but was unsure of how to, really. Is the radius of a shape available using a shape query? That would be awesomely helpful if so. I may have missed it, so I apologize if that's a retarded question. If it's a circle shape then you can do cpCircleShapeGetRadius(). Ah yes, excellent. I think I can fix this up then, thanks Scott. You're awesome.